Philippe Petit: "Why?" That is the question people ask me most. Pourquoi? Why? For what? Why do you walk on the wire? Why do you tempt fate? Why do you risk death. But, I don't think of it this way. I never even say this word, death. La mort. Yes of okay, I said it once, or maybe three times, just now... But watch, I *will* not say it again. Instead, I use the opposite word. Life. For me, to walk on the wire, this is life. C'est la vie. 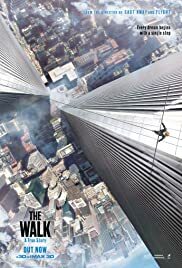 Robert Zemeckis' signature visual style and proclivity for bio-pics seemed perfect for a movie like The Walk, a film that manages to boast an interesting and entertaining story and dizzying cinematography. The Walk is based on the story of the real-life high wire artist Philippe Petit in 1974. Inspired by a circus he saw at a young age, Philippe begins planning an incredibly ambitious -- and highly illegal -- show in which he hangs a wire across the Twin Towers and walks across them. A majority of the story is dedicated to Petit gathering accomplices to help with the coup, practicing for the extreme conditions and planning how they will rig the wire. The clever writing allows you to connect with every character and understand why they're trying to attempt this impossible dream. The last 45 minutes or so is where "the walk" actually happens. The scenes of Petit and co rigging the wire are just as tense as the wire-walking scenes, which are accented by some of the best cinematography of the year. The cinematography is really the star of the movie here. The shots panning down towards the ground make the towers almost look endless, and it adds so much tension to the walking scenes. The Walk is a stylish and entertaining look at one of the biggest artistic feats of the last century, and you need to watch it in IMAX 3D.